Ladies Naples Pure Shetland Wool Tweed Jacket. Dry Clean Only. I am very pleased with my order and the service I will shop with you again. As usual, a lovely fabric and a good fit. I have received several compliments on the new outfit. 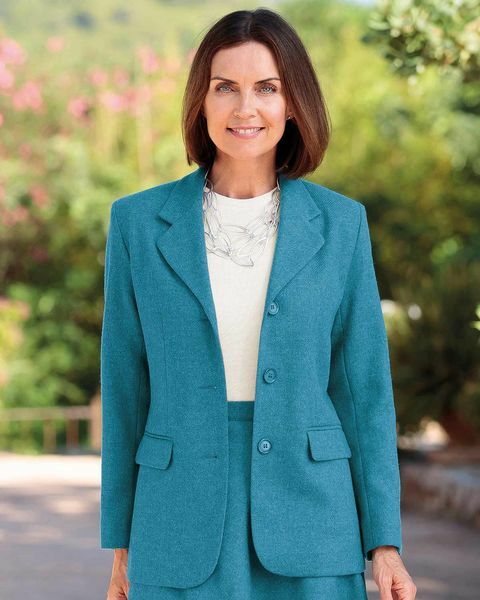 "I am very pleased with my order and the service I will shop with you a ..."
Ladies fully lined, three button style jacket with gently shaped lapels and darts. Single breasted with front jetted and flap pockets. Medium weight pure shetland wool in teal tweed. Woven for us in the UK. This jacket will give you a classic elegant look for years to come.